Enjoy the popular traditional look in your bathroom with this beautiful vanity. Make your bathroom look like new with this good-looking, useful set from Magick Woods. Coverage for all vanity cabinets lasts from 3 years from the original date of purchase. For more information please call 1-855-995-5578. With a classic look and strong design, this vanity will help any bathroom look nicer. The good-looking brown granite counter and brown solid wood base make a big difference in your bathroom. Put a nice touch on your bathroom's look with this vanity set from Avanity. Add this vanity to your bathroom for more classic style in your home. The white artificial stone counter and white particle board base make this piece great for any bathroom. Soap, towels, cleaning supplies, and other bathroom items have a home in the double-door cabinet of this vanity. Make your bathroom look like new with this good-looking, useful set from Magick Woods. Enjoy the popular traditional look in your bathroom with this beautiful vanity. Made with Espresso particle board base and a off-white artificial stone counter, this piece will make your bathroom look even nicer. The simple double-door cabinet is great to keep bathroom items in. This set from Magick Woods is great for anyone looking for great style and function in their bathroom. This vanity has both an all-around look and a traditional style. The white artificial stone counter and espresso particle board base make a beautiful look in your bathroom. Keep many bathroom items in its roomy drawer and double-door cabinet. Put together your perfect bathroom with this stylish vanity set from Magick Woods. Ashwell 61.13-inch W 3-Drawer 4-Door Freestanding Vanity in Nutmeg Enjoy the popular traditional look in your bathroom with this beautiful vanity. Make your bathroom look like new with this good-looking, useful set from Magick Woods. 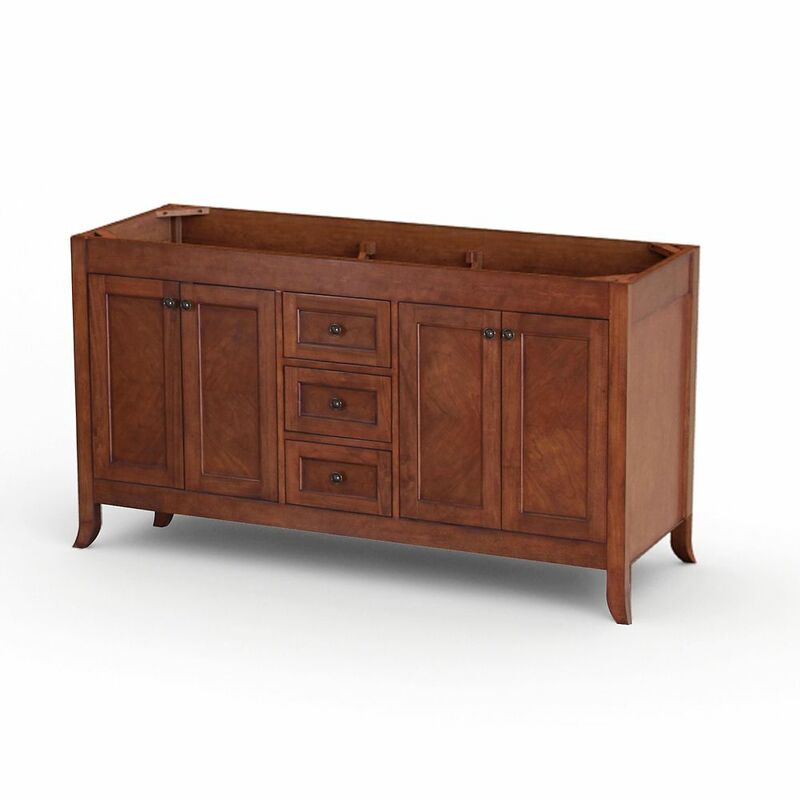 Ashwell 61.13-inch W 3-Drawer 4-Door Freestanding Vanity in Nutmeg is rated 3.0 out of 5 by 4. Rated 5 out of 5 by Deb HC from Beautiful and quality! Very happy with the quality of this cabinet! When I ordered it I knew it wouldn’t sit flush, but gambled that we could easily trim the very bottom edges of the 2 legs (just on the right side). It was wood as the ad stated so we could no problem! It also came in only a few days of ordering! Very pleased! *The top was ordered separately from another company. Rated 5 out of 5 by Jane from Craftmanship Vanity arrived in very good condition, appears to be well constructed, colour is as appears online. Rated 1 out of 5 by Unhappy customer from Read the fine print You may have filtered your search by vanity’s with top but don’t be fooled by this. In the description in brackets it says top sold separately. What was the point in looking at vanity’s with top then? This vanity was no longer a good deal and we will most likely be sending it back. Just a heads up.